John Brennan is Lying - NO WAY He Wasn't Involved with Russia Hoax from the Beginning! John Brennan is Lying – NO WAY He Wasn’t Involved with Russia Hoax from the Beginning! Just a few weeks ago former CIA Chief John Brennan attacked President Trump saying Robert Mueller would indict Trump family members on collusion as his last act. Let’s put this in perspective. Mr. Brennan was not a disinterested third-party with no direct knowledge of the facts of the Russia investigation. He was not a shoe salesman in Des Moines while all this was transpiring. He was not a florist, a cab driver or the manager of a supermarket. He was in short, not just another American, doing his best to figure out the facts from what passes for the news these days and guess the truth. He was the head of the CIA. ….In this context, what are the chances that the FBI received information from a former member of British intelligence and did not inquire of CIA what they knew about Mr. Steele, the circumstances under which he left the Queen’s employ and his reputation for truth and veracity. In this context, what are the chances that the FBI came into possession of information regarding the actions of Donald Trump, his connections to the Russians and possible meetings on foreign soil and did not ask CIA what they knew already? What are the chances that the FBI opened an investigation into possible Russian connections to the man who could be the next President of the United States and did not engage with CIA about these counterintelligence concerns? What are the chances that while the FBI was conducting an investigation into the possibility that the Kremlin was one step away from putting a controlled agent in the White House the CIA simply stood by, did nothing, contributed nothing, investigated nothing and waited for the FBI to finish its work. And finally, what are the chances that conversations between the FBI and the CIA regarding a possible counterintelligence threat that could reach to the Oval Office were not, at a minimum, brought to the attention of the most senior levels of CIA leadership. Again, zero. 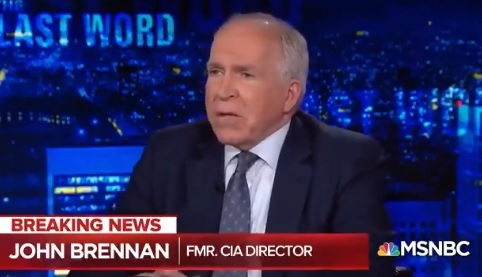 In fact, Mr. Brennan has previously admitted publicly that an inter-agency task force on the topic was stood up, that it worked out of CIA Headquarters and that he was aware of its work. Obama’s Head of the CIA John Brennan is more than disingenuous when he states ignorance on the Russia Hoax. He is more than disingenuous when he plays stupid about Obama and the Deep State’s actions to remove President Trump from office. Brennan was clearly in on it!